A new study chronicles how central Asia dried out over the last 23 million years into one of the most arid regions on the planet. The findings illustrate the dramatic climatic shifts wrought by the ponderous rise of new mountain ranges over geologic time. Researchers have long cited the uplift of the Tibetan Plateau and the Himalayan Mountains around 50 million years ago for blocking rain clouds' entry into central Asia from the south, killing off much of the region's plant life. 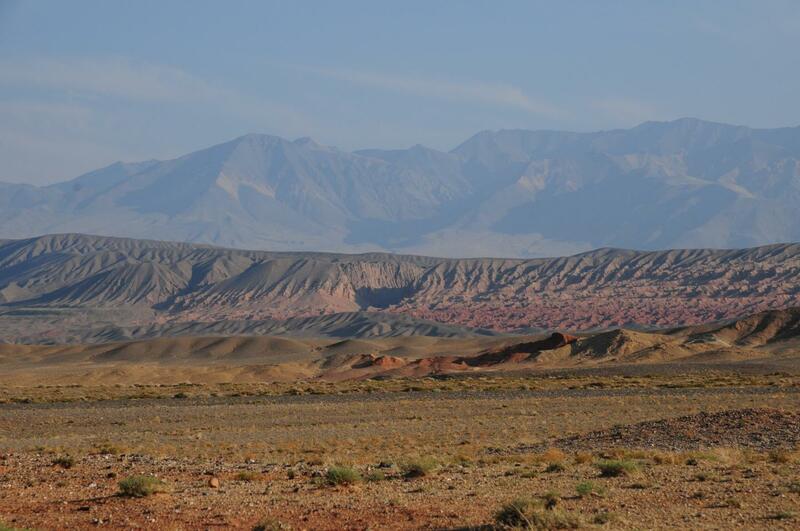 The new study, published online in the journal Geology, paints a more nuanced picture of Central Asia's desertification. It suggests that the relatively recent rise of lesser-known mountain ranges, such as the Tian Shan and the Altai, further sealed off moisture from the west and north. As a result, great stretches of what we now consider western China, southwestern Mongolia and eastern Tajikistan became barren earth or laced by sand dunes. "While Central Asia was probably never lush and verdant, it was certainly greener 23 million years ago and probably even greener in the more distant past," said Jeremy Kesner Caves, the lead author of the study and a doctoral student at Stanford's School of Earth, Energy & Environmental Sciences. "One way to think about this change is that when viewed from space today, Central Asia appears very brown because of its expansive deserts," Caves said. "If viewed from space 23 million years ago, though, Central Asia would have looked somewhat darker, simply due to there being considerably more leaves and vegetation." Caves and his co-authors arrived at their conclusions after measuring the carbon isotope values in buried, ancient soil samples. A particular isotope, or version, of carbon found in the samples speaks to the dryness of conditions at the time of the soil's deposition. Wetter, rainier conditions allow for greater numbers of organisms, including plants and soil-dwelling bacteria, to thrive and pull carbon out of their surroundings to fuel their growth and metabolism, leaving telltale carbon isotopes in their environment. Previously, scientists had relied on these sorts of soil sample measurements primarily to study plant types and atmospheric carbon dioxide levels. Caves and colleagues instead looked at samples over extensive geographic and temporal spans in order to draw a fuller portrait of the climatic changes influencing soil composition. "Our paper is the first-ever attempt to present maps of carbon isotopes over a geologic time frame of more than a million years," Caves said. He and several co-authors traveled to Mongolia, eastern Kazakhstan and northern China to collect the bulk of 171 new soil samples, while Russian co-authors collected samples near Lake Baikal. The new specimens were considered alongside more than 2,200 previously collected samples. Because most of those existing samples originated from the Tibetan Plateau, the research team plugged a gap in the geographical coverage by going to little-studied northern central Asia. The samples themselves "are honestly pretty boring," Caves admitted. "Basically, they look and feel like dirt." But the rocky outcrops exposing the old, hardened soil chunks can dazzle. "The outcrops are striped deep purple, red and green, and they often erode in crazy patterns," Caves said. "Imagine Badlands National Park in South Dakota or the Painted Desert in Arizona." Overall, the samples were well-distributed from 23 million to 2.6 million years ago during a geological period known as the Neogene. The Earth's climate cooled off substantially as the Neogene wore on, setting the stage for an Ice Age when glaciers crept from polar regions into lower latitudes. Upon analysis, the samples' carbon isotope values revealed an exceptionally arid region deep in Asia's interior going back 23 million years, initially ringed by areas of higher rainfall. Starting about five million years ago, however, that dry region expanded to the north and west, as new mountain ranges reached heights sufficient to block westerly winds from delivering moisture. The findings will help researchers disentangle how much of Central Asia's de-greening occurred in response to localized geological changes versus global shifts happening during the Neogene. With this compelling demonstration of using ancient soil samples as proxies for regional climate in Asia, Caves now plans to extend his investigations elsewhere on the globe. "I hope to be able to apply this method to other continents, such as North America, where there are large datasets of carbon isotopes," Caves said. Doing so could illuminate impacts on western North America's climate due to the uplift of the Sierra Nevada in eastern California, as well as the Rocky Mountains further east, which reached near their present elevations around 40 million and 50 million years ago, respectively. "Only by making these continental-scale maps, like Jeremy has done for Central Asia, can you further understand how the uplift of mountain ranges controlled rainfall patterns against this backdrop of global cooling in the Neogene," said Page Chamberlain, co-author of the study and a professor of Earth system science at Stanford. "North America is really ripe for this kind of research." Other Stanford co-authors on the study include graduate student Daniel Ibarra. Page Chamberlain is also a member of Stanford Bio-X and an affiliate of the Stanford Woods Institute for the Environment. Other co-authors are from Dartmouth College, the Institute of Zoology in Kazakhstan, the China University of Geosciences, Northwestern University, L.N. Gumilyov Eurasian National University in Kazakhstan, and the Institute of the Earth's Crust in Russia. Funding was provided by the National Science Foundation, the Stanford University McGee Grants, the Geological Society of America, and the National Basic Research Program of China.